The PACE PAL® underwater pace clock was designed and developed by a lifelong swimmer. It’s challenging to keep motivated and stay on pace in the pool each day. 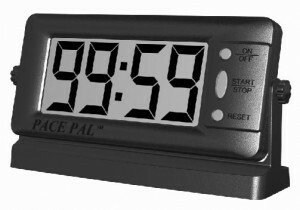 The PACE PAL® underwater pace clock was created to meet that need with it’s high contrast LCD screen and highly visible BOLD DIGITS. Naturally portable in nature, it weighs just over 3 lbs and fits into exercise bags easily. It’s long life battery is also easy to replace if needed. PACE PAL®’s are Ideal for Endless Pools and for Ultra Short Race Pace Training sets. Naturally PACE PAL® can be used above water as well which maximizes it’s usability as well as your investment. Pace Pal © 2019. All Rights Reserved.